1. My Book Therapy’s take on the Wizard of Oz. There was singing. There was dancing. There were costumes! And when they mentioned the “Agent of Oz”, I didn’t think much of it until the lion said “But he’s so scary.. and intimidating!” and I thought Dude! It’s gonna be Chip! 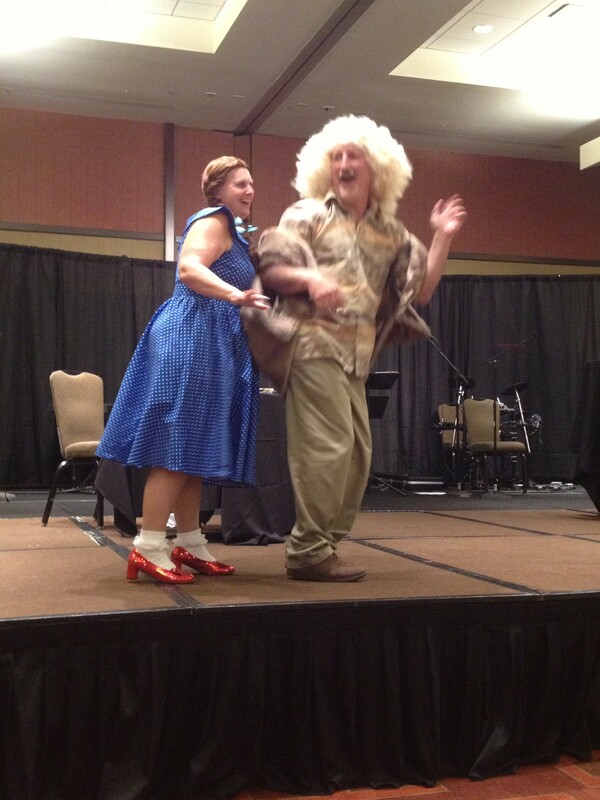 Major props to all the people in MBT’s take on The Wizard of Oz. Great talent all around. 2. 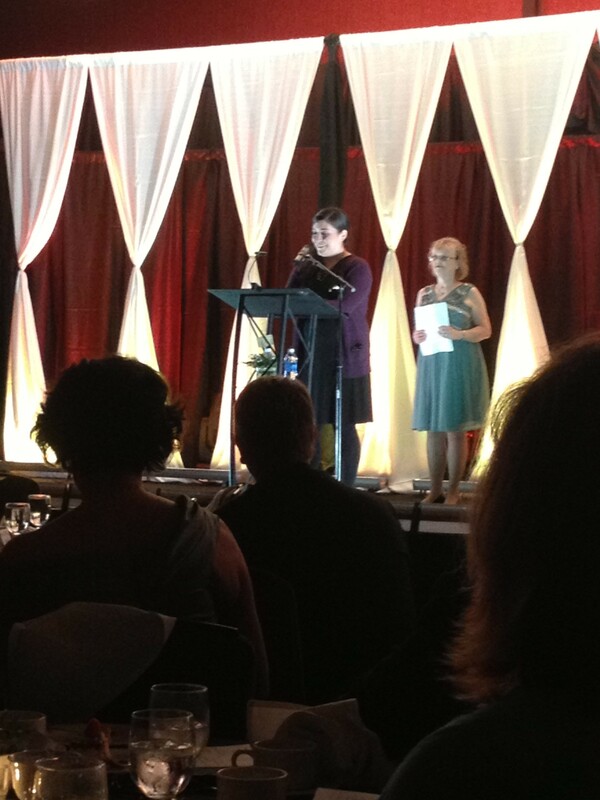 Laurie winning the Genesis in the Contemporary category. 3. Pinning a boutonniere on Frank Peretti. (Seriously. Laurie and I had to withhold the “oh my gosh, it’s Frank Peretti! !” enthusiasm when he walked by as we were waiting for appointments.) So Allen Arnold (for some reason I feel compelled to refer to him by both his first and last names) kindly offered to introduce me to him. 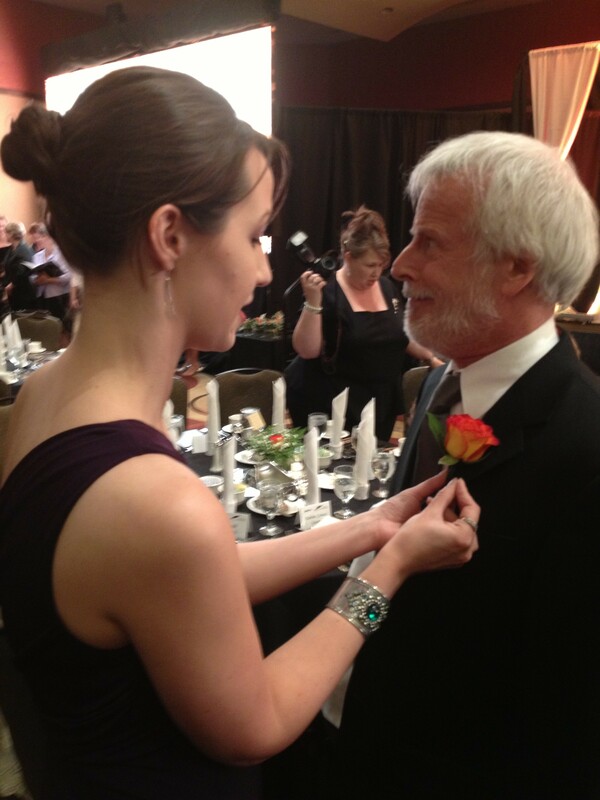 Frank was the guest of honor for the gala (since he was receiving the Lifetime Achievement Award) so Allen Arnold had been given a boutonniere to give him. I made a joke about him pinning it on Frank which he wasn’t particularly eager to do. When Frank came by, I told him how much I had enjoyed growing up with his kids’ books, and then Allen Arnold offered to let me pin the boutonniere on Frank. Ok, seriously… I don’t have a lot of experience with these things. So I was a tad worried I wasn’t going to be able to get it stay or I’d end up being known as the girl who pin-stabbed Frank Peretti. Minor details. But I managed to get it on with no stabbing! When I saw him later, the boutonniere was even still in place. Score! Super major thanks to Allen Arnold for letting me have the opportunity. Whew. So many good times. It felt weird to be home after all of that. I don’t think I was done yet. It was one incredible weekend, but I guess the purple chucks have earned themselves a break. What is it about the song? I’m not sure. It’s quirky and fun but still deep enough to resonate with me. I guess sometimes I feel like a firefly, just a little bug trying to send out a light so I don’t get lost in the darkness. I’m reminded of that as I scramble to keep up with work while getting everything together for a writers’ conference this weekend. If you find yourself at the ACFW Conference, look for the girl with the purple chucks who’s rocking out to this song. That’ll be me. Feel free to say hi. I’ll try not to blind you with my firefly light.